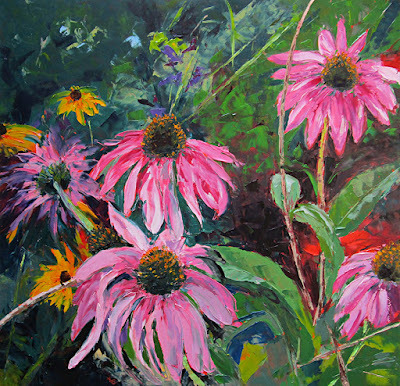 This is the second of the flower paintings I completed last weekend at The Artist's Studio & Gallery at Patriot Place. 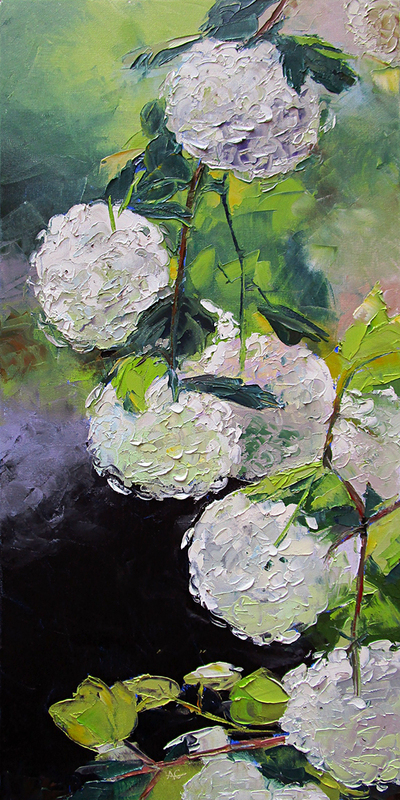 While blue hydrangeas are more common around here in New England, I was attracted to the colors in this image and the challenge of painting whites. I guess I have started somewhat of a flower series of late. And I have been gradually increasing the size of my paintings because I bought a 24" by 48" canvas recently and I need to practice with the larger palette knives. Last weekend, while working at the Artist's Studio and Gallery at Patriot Place, I was able to get a couple of flower paintings completed. 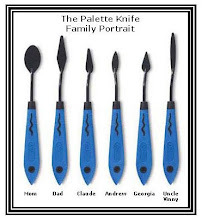 This is the first one, a pretty large size so I brought out my bigger palette knifes to paint it. Flowers are great fun to paint with a palette knife and very freeing since there is no real perspective or likeness required. 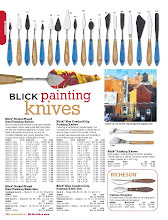 Just thick slabs of paint and great colors to mix. We've had our art gallery at Patriot Place for about 6 years now. Each week Jo Ann, the wife of one of our anchor artists, Frank, provides the gallery with a bright spot of color with fresh flowers displayed in a variety of unique vases from her collection. It's it always so interesting to see what she brings to the table-literally! 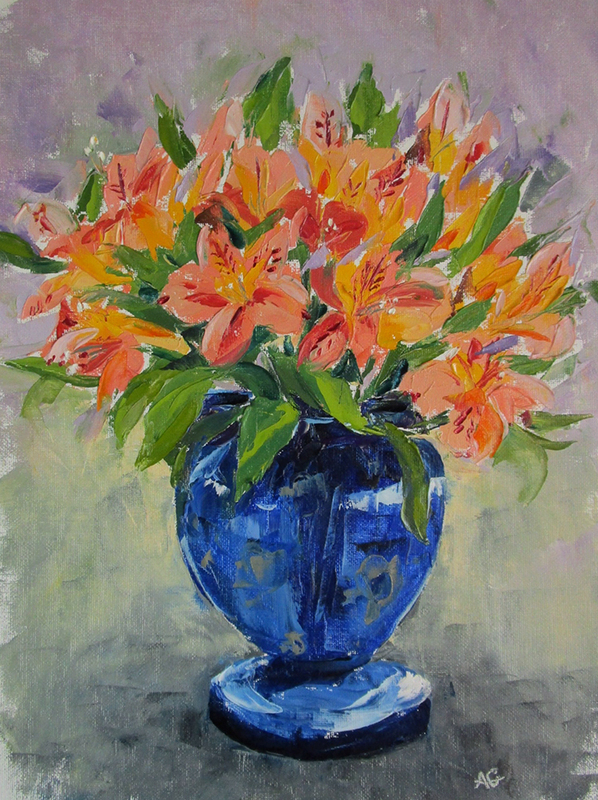 The inspiration for this painting was from her latest arrangement that was at the gallery the last weekend that I was working there. 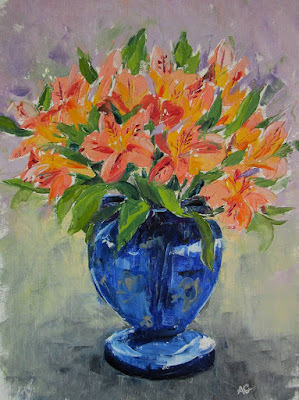 I was so attracted to the complimentary colors of blue and orange, it was just calling to be painted. And-we have some BIG NEWS that our gallery is moving to a bigger space within Patriot Place! I will post some photos of the new space once we move in next week and get settled, but I'll have to get busy painting since we've got a lot more wall space to cover. 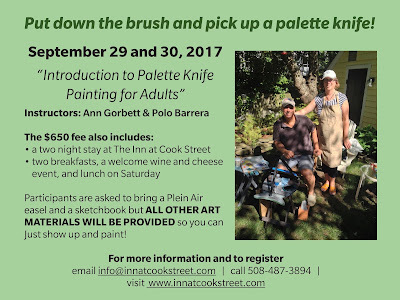 We are excited to announce our September 29 and 30, 2017 palette knife painting workshop. September is a beautiful time in Provincetown and we would love to see you join us. 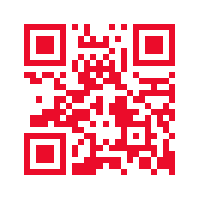 Check out the Inn at Cook Street here. Every room is fabulous and John and Pat are the best hosts you could ever have. This is such a DEAL!